Barnes is a place in Surrey, but by the nineteenth century as a surname it is distributed over the country. It was most prevalent in Lancashire, followed by Surrey, Hampshire and Kent. It is, however, a fairly common name, so difficult to assess where Benjamin’s family originated, and also difficult always to sort out whether we have the correct person. Benjamin’s father was a house painter and decorator, working for himself. He had been born in Newington, South London about 1851, his father Richard also being a house painter. Henry Thomas Barnes married the 21-year-old Sarah Louisa Booth in St Mary’s Whitechapel on 7th November 1877. On the 1911 census they say they have had 14 children, five of whom had died. They lived most of their married lives in 10 Ellery Street, Peckham/Camberwell, and were still there on the 1937 Electoral Roll. Henry Thomas died in January 1939. Benjamin’ mother was Sarah Louisa Booth, born 1856 in the City of London, district of St Andrew Undershaft. She is almost certainly the five-year-old Sarah Booth living in 1861 in Cradle Court, St Mary Axe, with her parents William Samuel Booth, silversmith (born City of London), and Louisa (born Prittlewell, Essex). This is assumed because of the unusual conjunction of that Sarah’s brothers’ names – Andrew, Alexander and Benjamin – all of which Ben’s mother gave to her own sons. And her tailor grandfather was also called Andrew. Both before and after her marriage in 1877, Sarah Louisa lived at 10 Ellery Street, Peckham. Indeed, up until 1937, the couple are still on the Electoral Roll in Ellery Street. Sarah probably died in March qtr 1938. Ben’s known brothers and sisters were: Henry Thomas (1873), Louisa (1875), Alexander George (1881), Susan (1883), Andrew John (1888), Richard J. (1889), Rose (1894) and Kate (1898). Henry Thomas was a house painter like his father, and two of the other boys were butchers. What work the girls did is more difficult to track down, although one was a laundry worker, As their surname is not that unusual, it has not been possible to discover the names and birth order of the five who died, so the numbers given to each siblings are the order of those known to have survived. The apparent oldest child, Henry Thomas (junior) was born in 1873. He eventually became a house painter like his father, although around 1901 he is described as “asphalter”. On 26th March 1894 he married Emma Maria Charlotte Smith at St Antony’s Nunhead. She was 21, the daughter of a plasterer, William Smith. Henry gave his address as 10 Ellery Street, Emma’s was 41 Peckham Rye. Two years later the couple’s only child Violet was born. In 1901 they and Violet are visiting Jesse Barnes and family in St Albans, Hertfordshire. It is not certain how or if Henry and Jesse are connected, because Jesse was born not in London, but in Baldock, Herts. Ten years later Henry, Emma and Violet are living in Ellery Street at No 8, and the fifteen-year-old Violet is occupied in wig-making. Henry Thomas seems to have died in Camberwell in 1942, Emma in 1956. Violet does not appear to have married, but there are various alternative possibilities for her death. The second surviving Barnes child, and first daughter, was born in Southwark in 1875. In the 1881 census, unsurprisingly she is living with her family group, but little more has been found about her. Alexander George, the second surviving Barnes son, was born in Newington in 1881. He is not with the family group in 1901, but working as a butcher when, on 15th March 1903, he married Edith May Potts, father a carpenter. She gave her address as No 8 Ellery Street, Alexander as No 10. Alex and Edith had at least one daughter Dorothy May. According to his campaign medals Alex seems to have served in World War 1: Private 5328809 in the Royal Berkshire Regiment – see They Also Served (WW1). He died in Catford on 13th February 1944. Susan was born 1883, in Newington. She is probably the Susan Barnes who started at Cator Street School, Southwark on 23rd February 1891; her father’s name was Henry Thomas, but the address given was 41 Commercial Road, not Ellery Street. However, as her next younger brother Andrew John started at the same school on the same day with the same details, this deduction seems fairly conclusive. In 1901 Susan is still living with her family, but says she is a laundry worker. Not much else has been found about her, although she possibly died March qtr 1963 in Lambeth. Andrew John (also known as Jack), the third surviving Barnes son, was born in 1888 in Camberwell. He was admitted to Cator Street School, Southwark on the same day as his next oldest sister Susan. Like his older brother Alexander, he was a butcher when he married on 27th March 1910 at St Mary Magdalen Peckham. 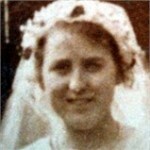 His bride was 24-year-old Mabel Alice Martin, daughter of Alfred, gardener. 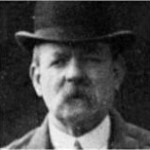 A witness was “George Barnes” (probably Andrew’s brother Alexander George). In 1911 Andrew and Mabel are living at 96 South Dongola Road, South Tottenham, Andrew described as a pork butcher. It is not known if they had children. There are no extant service papers for Andrew for WW1: innumerable men called A.J. Barnes were awarded campaign medals, but none jumps out as being Andrew John, although he was of an age to go. His death may have been in 1968 in Poplar district. The fourth Barnes son is a distinct mystery. Born probably in Sept qtr 1889, he is with the family group in 1901, but, apart from the uncertainty as to what his J stands for, he cannot be found in the 1911 census. There are lots of “Richard J . Barnes” who were awarded campaign medals in World War One, but none is obviously this Richard. He does apparently turn up in the 1947 and 1952 Electoral Rolls, still living at the family address 10 Ellery Street, but with no other people of the name of Barnes there. Then in 1959 an Edith J. Barnes is also living there, but it is not clear who she is, nor how she is related to Richard. And it is not easy to find out when Richard died. Benjamin of the War Memorial fits in here in the family order, the last son, born September qtr 1891 and killed 3rd July 1915 at Gallipoli. See his page for more details of his life and death. The third Barnes daughter, like her older brother Richard, is also a mystery. Born December qtr 1894, she is with the family group in 1901, but cannot be found in 1911. There is no obvious death for her between those years, nor a marriage, nor does she stand out on the electoral rolls, although she could be the Rose Barnes who died Jun qtr 1991 in Surrey North Western district. The life of the youngest child, Kate Barnes is much clearer. She was born 23rd November, 1898. She went to Lyndhurst Grove School, Southwark from 31 August 1901 until 27th July 1906 when she “transferred to the Girls’ School”. She was still at school in the 1911 census, and living with her parents and Benjamin in Ellery Street. 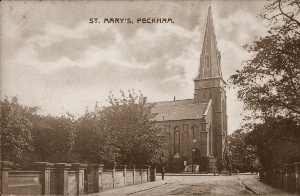 On 28th March 1920 at St Mary Magdalene Peckham, she married Francis (Frank) John Bird aged 23, a band sawyer, later a turner, and son of John, also a band sawyer. A witness was A.G Barnes (probably Kate’s brother Alexander George). Frank and Kate had two children, Joan Doreen (1921 – 2007) and Doris (1923) who married Leslie Parker in 1948. Frank died in 1986, Kate on 20th April 1994 in Leamington Spa. This is a composite list of the sources for all members of Benjamin Barnes’ family, but details for the individual family members are available if required. Virtually all of the sources mentioned can be viewed online via Ancestry, Find My Past and Free BMD.